In todays show Dr. John Bullock sits in as host of the Marc Steiner Show. He is Professor of Political Science at Towson University. We are joined by Reverend Frances Murphy Draper, the great-granddaughter of the founder of the Afro-American and lifelong citizen of Baltimore. 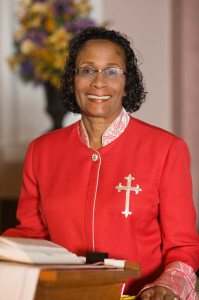 She is a Morgan State University alum and is pastor of John Wesley A.M.E. Zion Church in Baltimore. She speaks about her role as a ReligionMaker with the HistoryMakers project and her involvement with the Annual Back To School With The HistoryMakers Program coming up this Friday. Baltimore-based African American HistoryMakers and hundreds of HistoryMakers nationwide will give their testimony of pursuing an education, overcoming challenges on their path to success, and making a difference in their communities during the 6th Annual Back to School With The HistoryMakers program on Friday, September 25th. The theme of the day is “COMMIT.” More information about HistoryMakers at TheHistoryMakers.com.